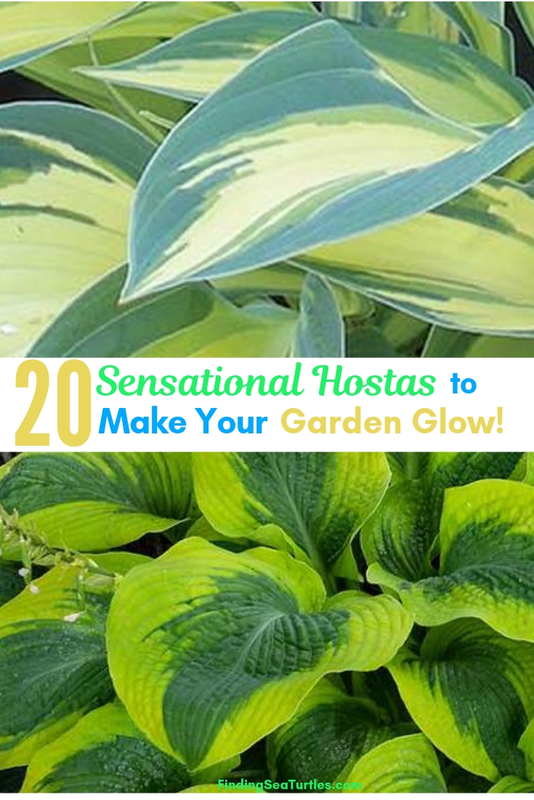 20 Sensational Hostas To Make Your Garden Glow! 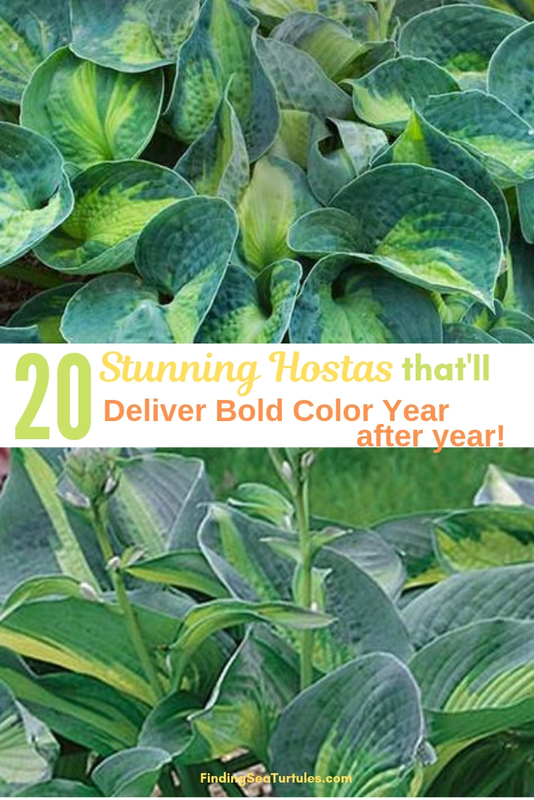 20 Stunning Hostas That’ll Deliver Bold Color Year After Year! 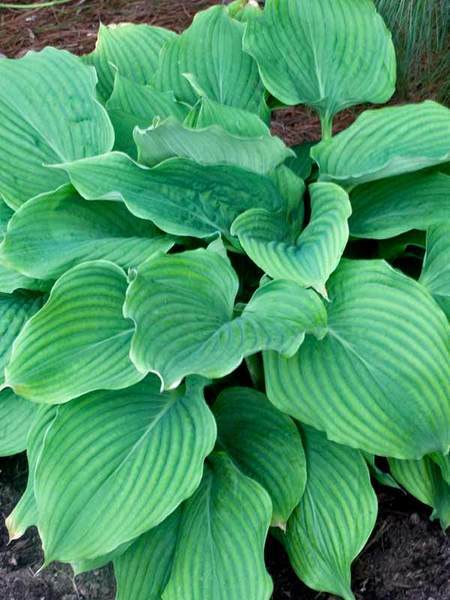 Looking for the best hostas for a shade garden area? Or maybe you would like to add a little drama to your shade garden? If you are having a tough time growing plants under trees or shrubs, maybe think about plants that thrive in the shade. Plants such as the Hosta plant. After several attempts at growing plants in deeply shaded areas, if your plants still struggle to survive there are alternatives. There is no need to feel frustrated. There are many options to this common problem. One solution is to add a hosta plant. Because hosta plants thrive in shade. 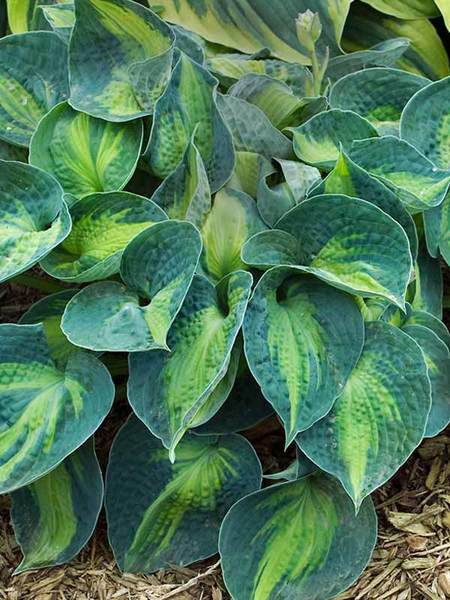 Hosta plants are tough, versatile shade tolerant wonders. Hosta plants can transform shady garden sites into a lush, easy to maintain landscape. Use hosta plants to create a dramatic and bold landscape. Or use them to create a calm, serene garden space. 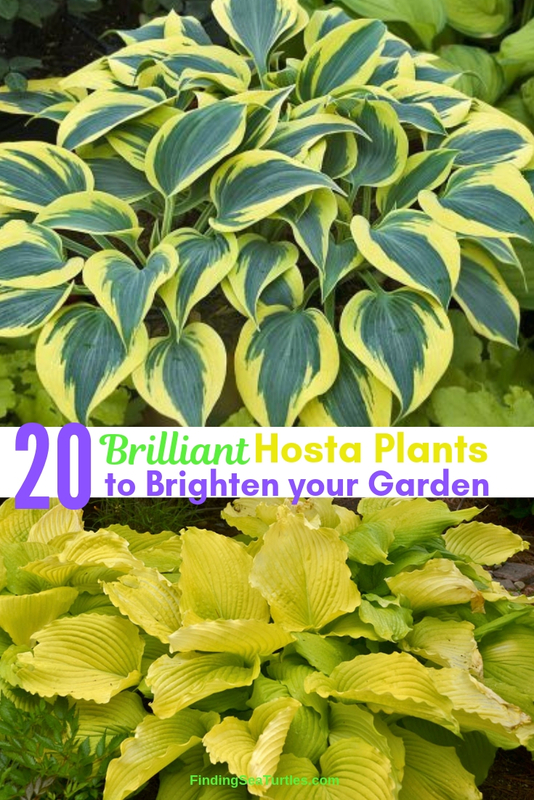 If you are unfamiliar with this gorgeous plant, you’ll quickly see how important the hosta is in gardening. First, as the hosta plant matures, it forms a tidy, circular mound. But the most amazing thing about hostas is their gorgeous foliage. Foliage that grows in many leaf patterns. The hosta leaf can be found in variegated, speckled, and striped patterns. Their leaf colors range from greens, blues, golds, yellows, and whites. So many types and color options. Hostas grow in many different heights and sizes. They all flower and many are fragrant too. The spikes are in pink, lavender, or white flowers that appear over the Summer months. The floral spikes attract butterflies and hummingbirds in the shady garden. Grow hosta plants in a variety of soils however, they prefer rich, organic soil. Some hostas are fast growers. And some hostas are medium growers. Some thrive in deep shade. And others can tolerate some Sun. 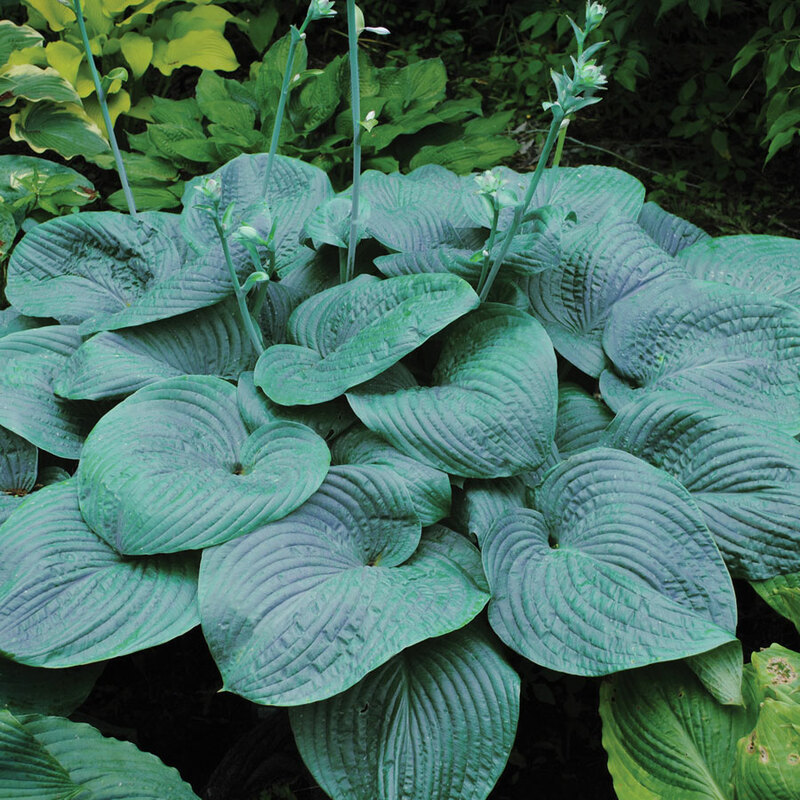 Use hosta plants in a mass planting site or even as ground cover on a slope or bank area. Low maintenance plants that are easy to grow and care for. 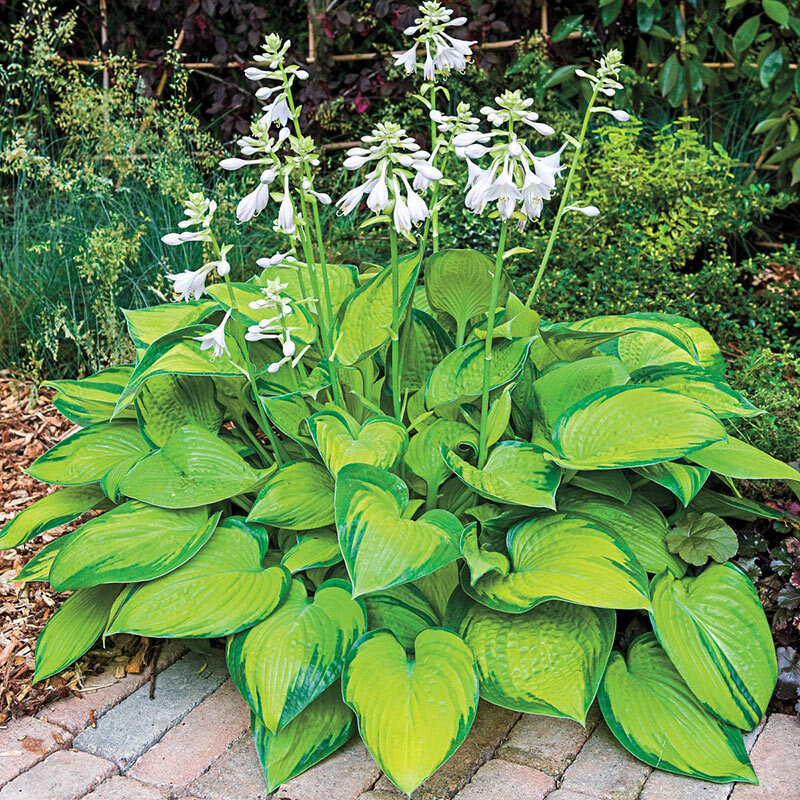 As you’ll see, hostas can be grown from a dwarf size to 6 foot wide size. Plant hostas around boulders, in rock gardens, and in containers. Hosta plants can make any shady garden stand out. But just as we are fond of hosta plants so are slugs, snails, deer, and rabbits. You may need to take measures to keep them from these magnificent shade plants. 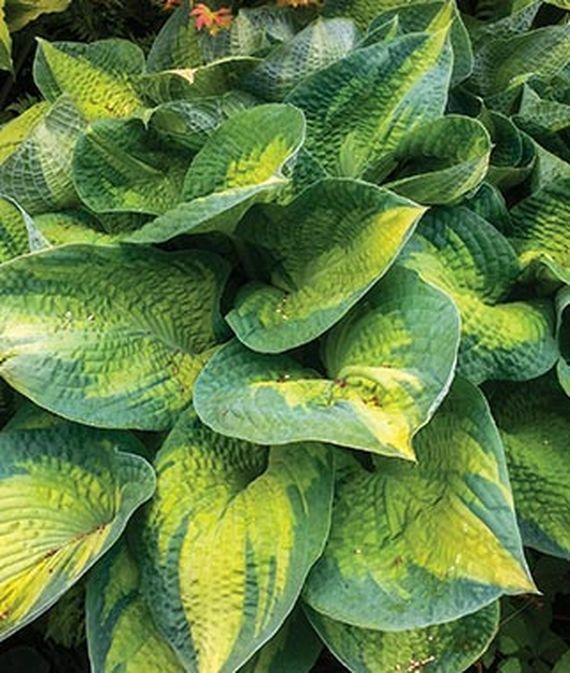 Take a look at the best hostas for shade. We are sure you’ll appreciate the hosta plants as much as we do. And be sure to let us know what you think. Touch of Class Hosta has dark blue with yellow centers. 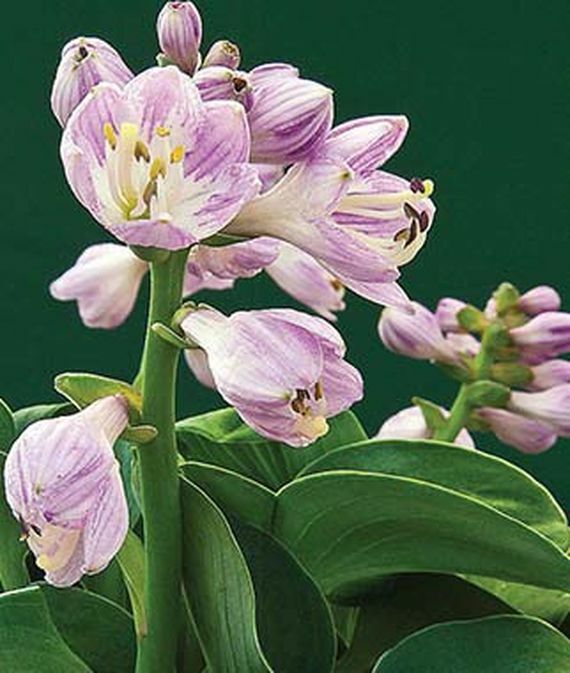 The Hosta Touch of Class is a variety of June Hosta but has leaves that are more upright. A small sized hosta with dark blue leaves and a yellow gold flame in the leaf center. A slow grower, Touch of Class has lavender blooms in midSummer. Plant in a full shade area in any moist, well-drained garden area. Can be grown in containers. Grows in zones 3 to 9 in part Sun and part shade to full shade. Reaches 24 inches tall with a spread of 16 to 20 inches wide. 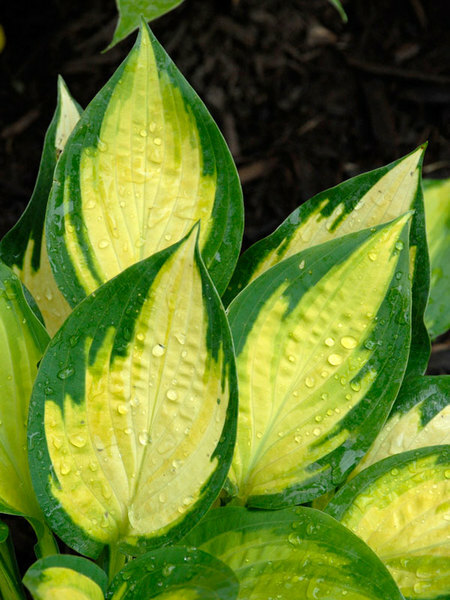 Paradigm Hosta has bright chartreuse streaked foliage with rich blue green margins. These colors become more vibrant and intense as the season progresses. Leaves have a corrugated texture. Grows in zones 3 to 8 in part Sun and part shade to full shade. Reaches 24 inches tall and with a spread of 20 to 24 inches wide. Use in garden borders, rock gardens, and woodland gardens. Can be used as a ground cover. Paradigm has pale lavender bell shaped blooms that appear in midSummer. Attracts butterflies. 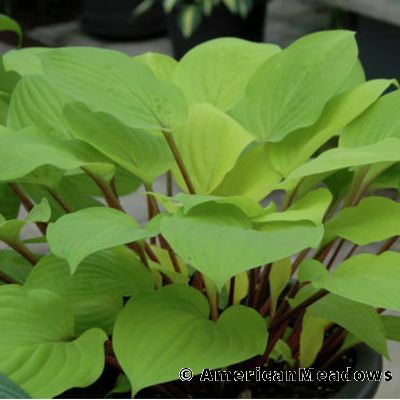 An easy to grow hosta with a medium growth rate. 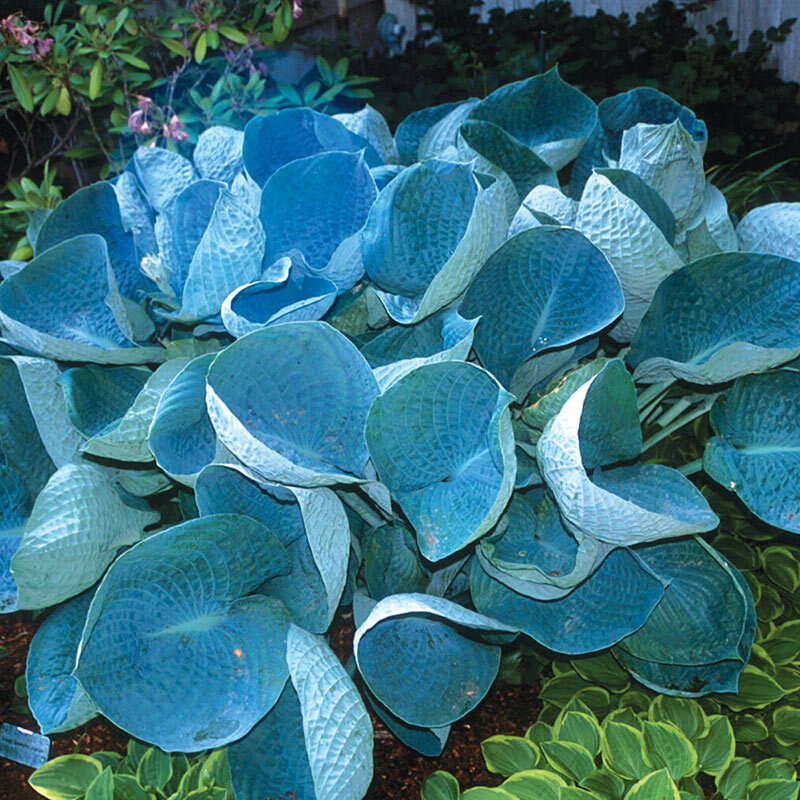 The Stained Glass Hosta is a variety of the Guacamole hosta. Stained Glass has shiny, deeply veined, golden foliage which resembles stained glass. Leaves are surrounded by a dark green margin. Fragrant lavender flowers appear in late Summer. Lavender flowers and foliage brightens shady areas. Grows in zones 3 to 9 in part Sun and part shade to full shade. Tops out at 14 to 16 inches tall with a spread of 20 inches wide. Plant in a moist, well-drained garden area. Can be planted in containers or in garden beds. Prefers sandy loam over clay due to the root aeration that sandy soil will provide. 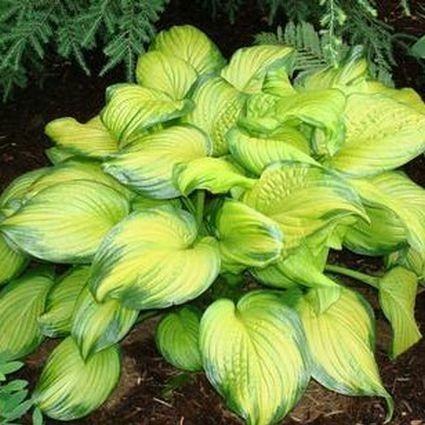 Brother Stefan Hosta has chartreuse centers with blue edges. The chartreuse center matures to gold with a green margin. Tall white flower spikes appear over the Summer. Grow in zones 3 to 9 in part Sun and part shade to full shade. Reaches 20 to 24 inches tall with a spread of 24 to 30 inches wide. A masterpiece of a hosta, Brother Stefan is striking. Planted en mass for an even greater impact. Kiwi Spearmint hosta has foliage that is dense and wavy with white to chartreuse colors. Margins are lime green. Lavender to light purple blooms appear over the early Summer. Grows in zones 3 to 9 in part Sun and part shade to full shade. Reaches 16 to 18 inches tall with a spread of 18 to 23 inches wide. Experience tropical drama with the Kiwi Spearmint Hosta. Cold hardy and low maintenance with striking color. 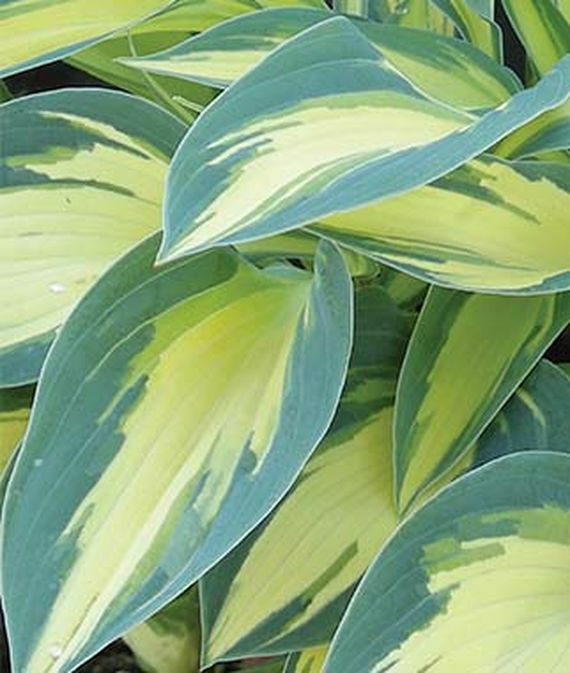 Magic Island Hosta has blue green edges with bright yellow centers. The yellow centers fade to cream. Summer blooming Magic Island has lavender spikes. Grows in zones 3 to 8 in part Sun and part shade to full shade. Tops out at 10 to 14 inches with a 16 to 20 inch spread. Blooms attract hummingbirds. Foliage is resistant to slugs. Robust grower, plant in garden bed and borders. Abiqua Drinking Gourd hosta has dark blue green puckered leaves that form unique cups over the plant. Produces blooms of 22 inch white bell shaped spikes in early Summer. Grows in zones 3 to 9 in part Sun and part shade to full shade. Tops out at 18 inches high with spread of 42 to 48 inches wide. Attracts butterflies. A great choice for dark borders, woody sites. Good resistance to slugs. Tolerates a variety of soil conditions. 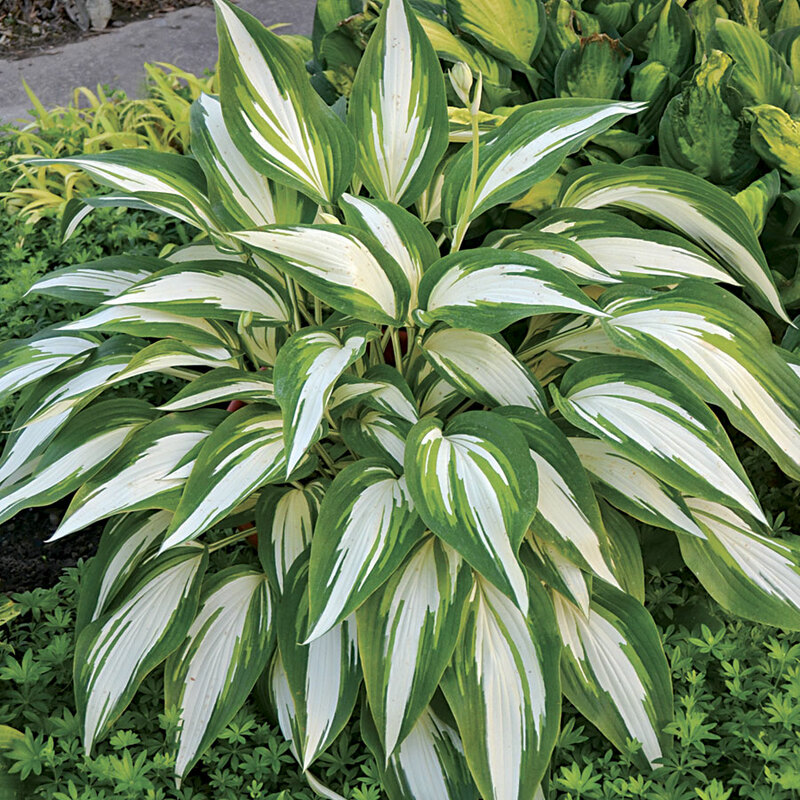 Hudson Bay Hosta has white centered foliage with bright green and blue borders. A strong grower that produces cream flowers in the Summer. Grow in zones 3 to 9 in part Sun and part shade to full shade. Reaches 24 to 26 inches tall with a 20 to 26 inch spread. Plant in garden borders or in garden beds. Coast to Coast Hosta has amazing foliage colors. 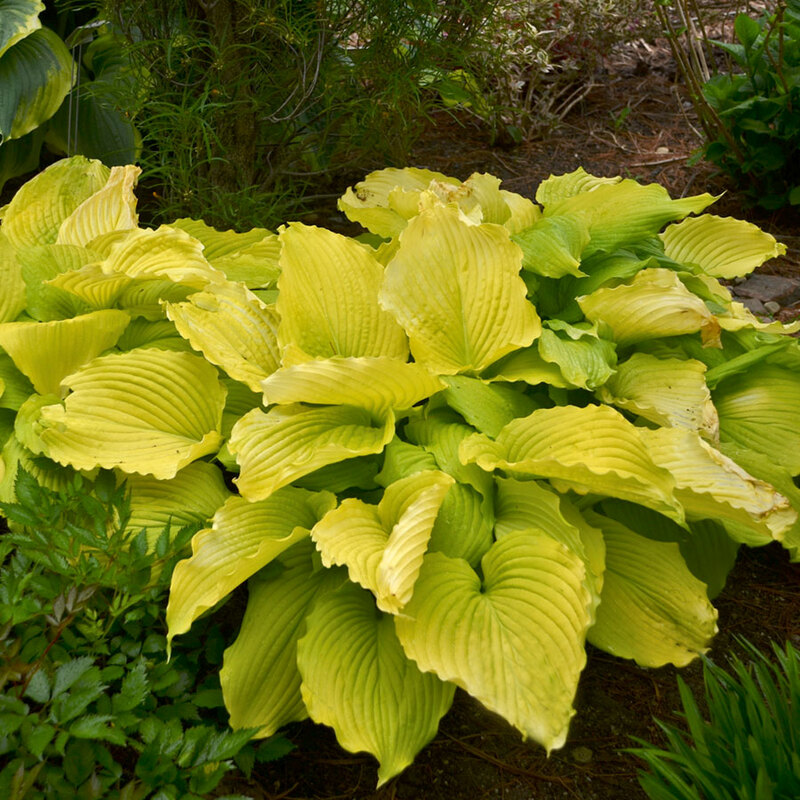 You’ll see chartreuse, gold, greens and yellows on large, arrowhead shaped leaves with textured deep ridges. Blooms are light lavender to light purple in color during the Summer. Grows in zones 3 to 9 in part Sun and part shade to full shade. Tops out at 28 to 30 inches tall and 32 to 36 inches wide. Attracts butterflies and hummingbirds. Easy to grow Coast to Coast delivers excellent foliage interest. Use in garden borders and beds. 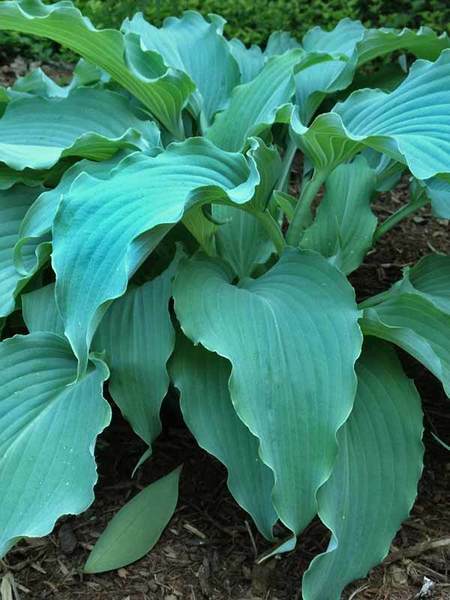 Blue Mouse Ears are a dainty hosta with beautiful petite round leaves. Leaves are a bluish green color. Blooms are on 12 inch lavender flower spikes that appear in the Summer. Grow in zones 3 to 8 in part Sun and part shade to full shade. Cute Blue Mouse Ears tops out at 6 to 8 inches tall with a 6 to 8 inches wide spread. Resistant to slug damage. Can be used in garden beds, borders, or as a groundcover. Autumn Frost Hosta is a low care perennial that is ideal for containers. A version of First Frost, ‘Autumn Frost’ has frosty blue leaves with extra wide bright yellow margins. Margins lighten to creamy white over the Summer. A 12 inch mound forms as Autumn Frost matures. Lavender flowers appear from mid to late Summer. Grows in zones 3 to 9 in part Sun and part shade to full shade. Tops out at 6 to 12 inches tall with a 24 inch spread. Medium growth rate, Autumn Frost attracts hummingbirds. Tolerates morning Sun which actually helps to intensify foliage colors. However, afternoon Sun can be damaging to most hostas. Likes moist, well draining organic soils. Fire Island Hosta also known as Plantain Lily, has bright yellow leaves on reddish-purple stems. Leaves turn light green as the season progresses. Spikes of lavender flowers appear in midSummer. Ideal for container planting or in a garden border. Grows in zones 3 to 9 in part Sun and part shade to full shade. Reaches 14 to 16 inches tall and 29 to 35 inches wide. Likes soils that are sandy, or moist and wet. Attracts Hummingbirds. A low maintenance perennial that is great for mass plantings. This Hosta is toxic to dogs, cats and horses, be sure block access. 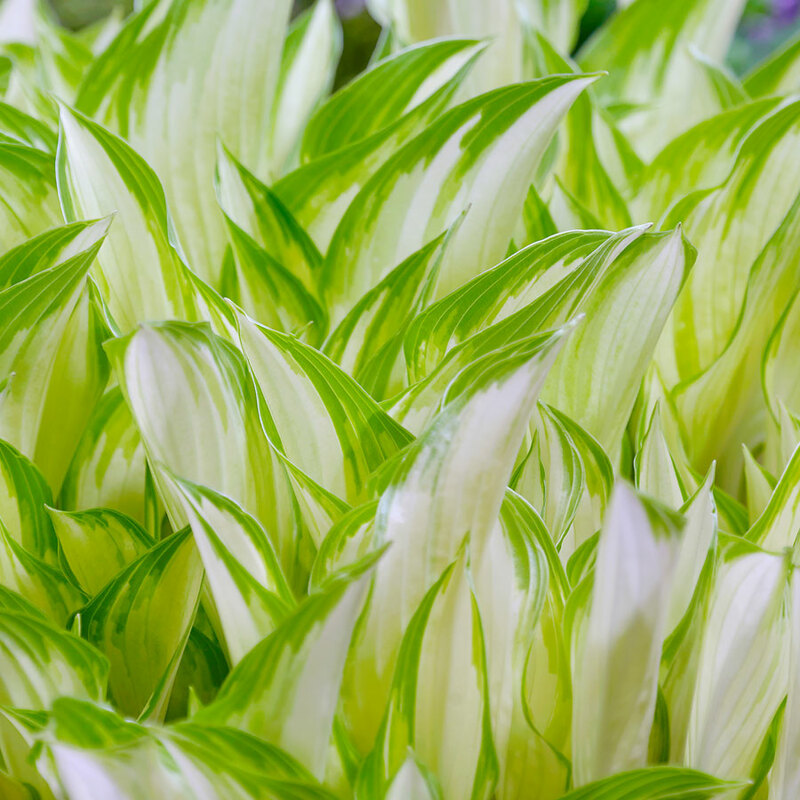 Cool as a Cucumber Hosta has long, smooth leaves with a jagged green margin and white center. An upright growth pattern when starting out, Cool as a Cucumber begins to arch as it matures. In early to midSummer, small pale lavender flowers emerge. Lavender flowers on pure, white stems stand out in a shady area. Grows in zones 3 to 9 in part Sun and part shade to full shade. Reaches 28 inches tall and 4 feet wide! Grow Cool as a Cucumber in a garden border, as a foundation plant, or in a woodland garden. Can also be planted in mass or used as ground cover. Attracts butterflies.This hosta is cold hardy and disease resistant. Tolerant of heat, drought, and humidity conditions. Easy to grow Humpback Whale has large blue-green corrugated leaves. The waves of blue green foliage resembles the deep oceans which the namesake calls home. The broad leaf features a hump in the middle where the tip dips downward similar to the tail of the marine mammal as it sinks to the lower ocean. Light lavender to white blooms appear in the Summer. Grows in zones 3 to 8 in part Sun and part shade. Reaches 3 feet tall with a spread between 4 to 7 feet wide! The lavender blooms attract hummingbirds and butterflies. The massive Humpback Whale likes moist soil. 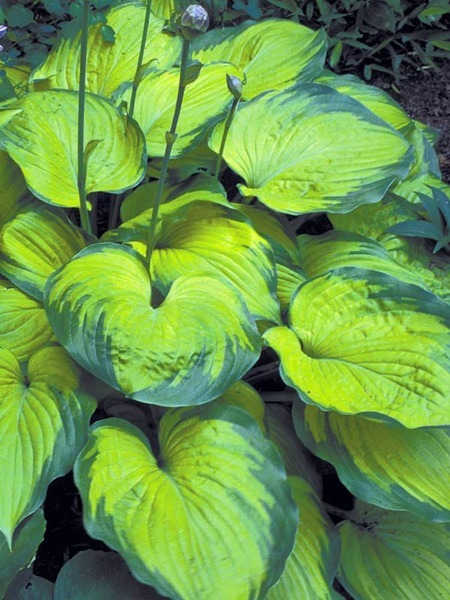 Rhino Hide Hosta, also known as Funkia or Plantain Lily has puckered, cupped foliage. The foliage texture is as thick and corrugated as a rhino’s skin. Margins are wide-blue surrounded by narrow golden-green slashes that brighten to a cream color. Blooms are white flowers that appear in the early to mid Summer. Hardy with strong slug resistance. Grows in zones 3 to 9 and in mostly Sunny to mostly shady areas. Reaches 20 inches tall. Likes soil that is normal or acidic. Attracts hummingbirds. Tolerates humidity, shade, and dry shade conditions. 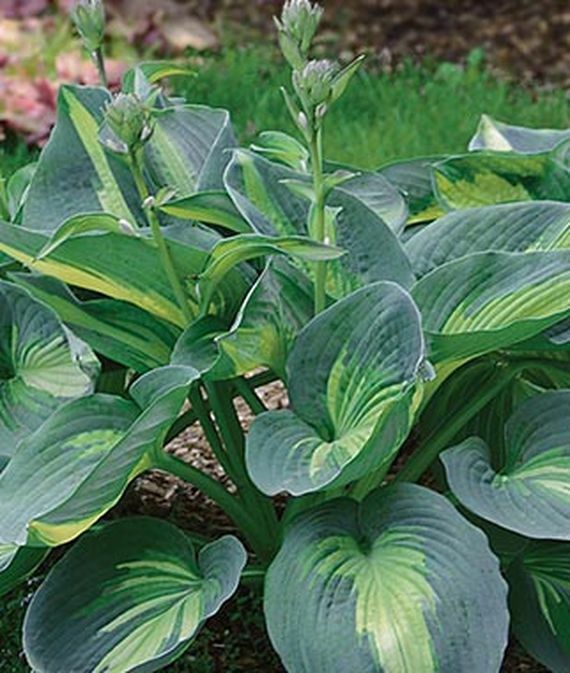 Neptune Hosta has rippled narrow wedge-shaped pointed leaves in a sea blue color. Named after the mythological god of freshwater and sea. The cascading waves of blue foliage are topped with lavender flowers on arching scapes in late summer. A slug resistant hosta that grows in zones 3 to 8. Likes mostly Sunny to mostly shady garden conditions. Tops out at 24 inches tall. Likes normal or acidic soil. Attracts hummingbirds. Tolerant of humidity, shade, and dry shade conditions. Can be grown in containers. Komodo Dragon hosta has large, dark green rippled foliage. Light lavender flowers appear in early to mid Summer. Grows in zones 3 to 8 in mostly Sunny to mostly shady garden areas. Reaches 30 inches tall. An upright 7 foot wide is a fast growing hosta. Likes normal to acidic soil conditions. Attracts hummingbirds. Tolerant of shade, humidity, and dry shade conditions. Old Glory, a Designer Hosta gas heart shaped golden yellow centers. Irregular, dark green margins surround the yellow centers. Chosen for its exemplary garden presence and performance. Lavender flowers wave above the attractive foliage in midSummer. Blooms from early Summer to mid Summer. Grows in zones 3 to 8 in mostly Sunny to mostly shady garden areas. Reaching 14 inches tall. Likes soil that is normal or acidic. Tolerant of humidity, shade, and dry shade garden areas. Attracts hummingbirds. Can be planted in containers. 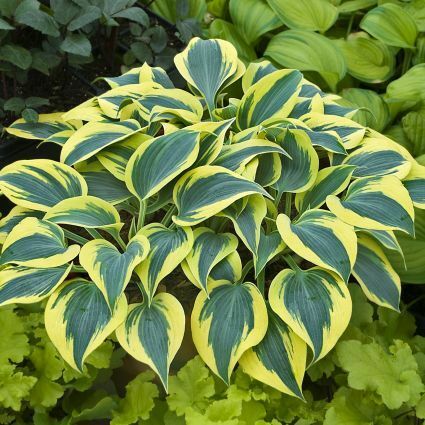 Afterglow Hosta has sprawling giant, heart-shaped green leaves edged with striking yellow margins. Blooms are a pale lavender color with funnel-shaped flowers. Blooms appear early to mid Summer. Grows in zones 3 to 9 in mostly Sunny to mostly shady garden areas. Tops out at 24 inches tall. Likes soil conditions that are normal or acidic. Attracts hummingbirds. Tolerant of shade, humidity, and dry shade garden areas. Orange Marmalade Hosta transitions through different color phases throughout the seasons. 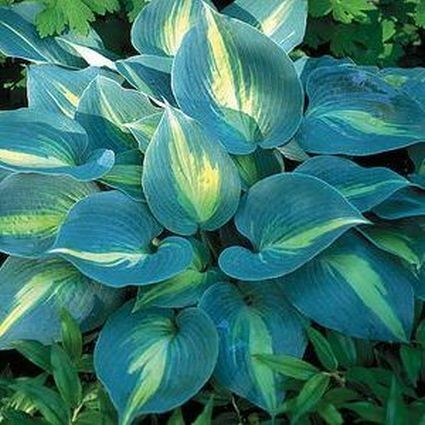 This hosta emerges with a green center and blue-green edge in the Spring. Then transitions to an orange-gold. Next Orange Marmalade becomes yellow and ultimately white. A gorgeous display. Flowers in light lavender appear in mid to late Summer. Grows in zones 3 to 8 in mostly Sunny to mostly shade. Reaching 17 inches tall. Likes normal to acidic soil conditions. Attracts hummingbirds. Tolerates humidity, shade, or dry shade conditions. 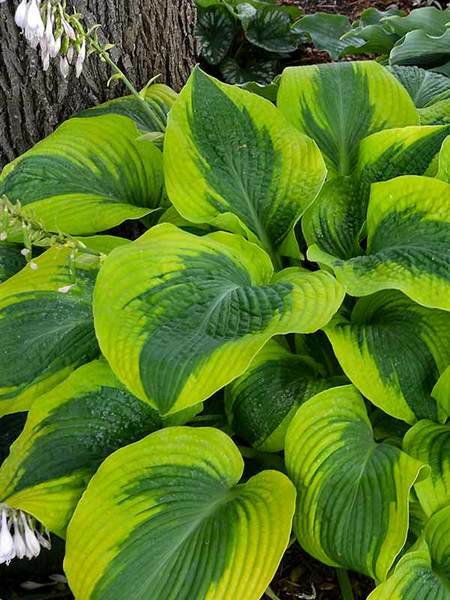 These are 20 Best Hostas for Shade Garden areas to help beautify your landscape. Hostas help with erosion control. And Hostas deliver stunning color to your shade or part shade garden areas. 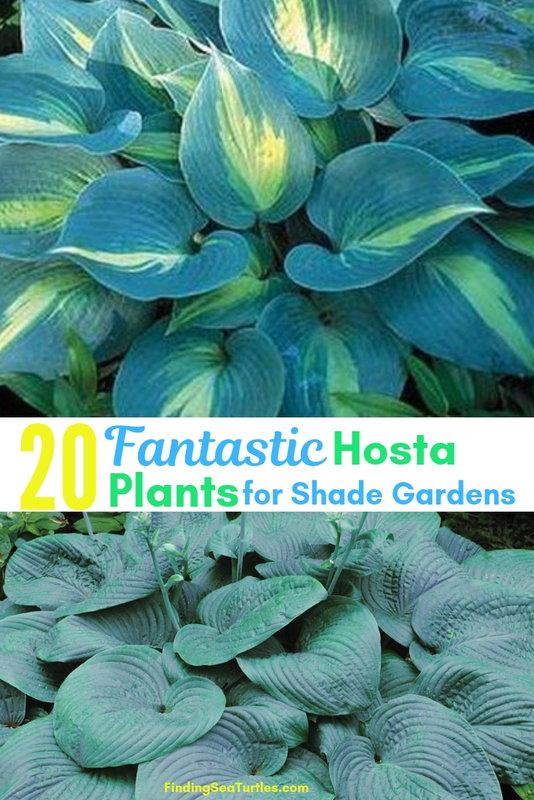 So, many amazing hostas that will solve your shade garden problems. 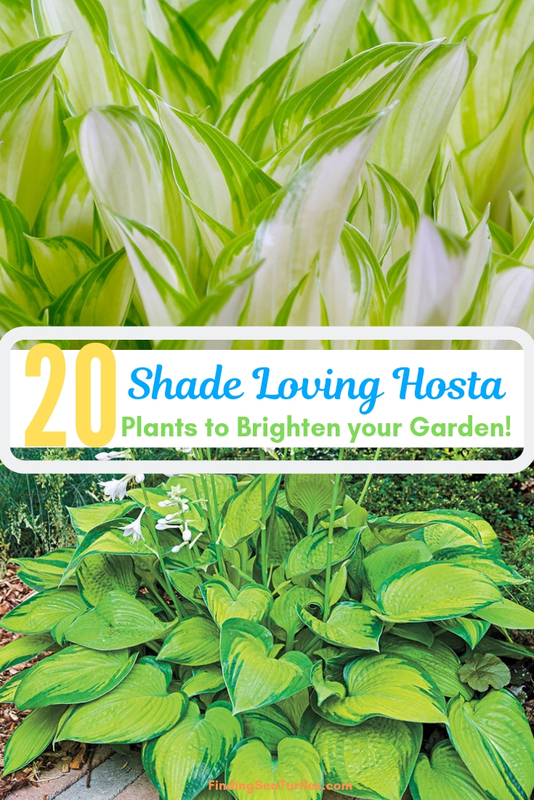 If you try these 20 Best Hostas for Shade be sure to let us know how you make out. And if you have any questions, feel free to reach out to us. We always are ready to help you out. Thank you for dropping by.